Our solar system’s first interstellar visitor was thought to be an asteroid, but is actually an ice and dust spewing comet. The first known interstellar visitor just got a little weirder. 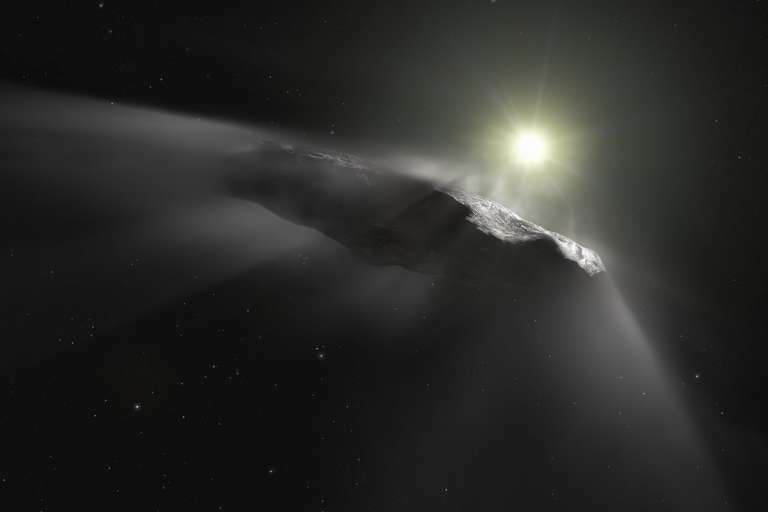 New observations with the Hubble Space Telescope reveal that 'Oumuamua is actually an ice and dust spewing comet, instead of a rocky asteroid. Astronomers made the discovery while trying to track the path of 'Oumuamua, including learning from what direction it came before whizzing through our solar system in October 2017. The object flew by Earth at a trajectory that is far above the flat plane of our solar system, where planets, moons, and other worlds tend to circle our sun. Its weird path, coupled with its high speed, led astronomers to conclude 'Oumuamua (pronounced oh-MOO-ah-MOO-ah) must be a visitor from another solar system. The team used Hubble because it is above Earth's atmosphere, allowing it to observe faint objects, study co-author Karen Meech, a planetary astronomer at the Institute for Astronomy at the University of Hawaii, explained in an e-mail to Seeker. "To our surprise, starting in November, our measurements started to show that 'Oumuamua was accelerating — in other words, its path was not controlled just by the gravity of the sun and planets. We explored many reasons for this and rejected all except one … that gas coming from 'Oumuamua was giving it an additional push." This means that 'Oumuamua behaves more like a comet. The solar system has many types of small worlds in it, including asteroids and comets. Asteroids are generally either space rocks or loose rubble piles, while comets have ice in the interior and near their surface. When comets near the sun and sunlight makes the ice warmer, the ice changes into a gas and pushes against the comet. Meech explained that this push can alter the comet's path through space. Warmer comets also emit a lot of gas and dust in a cloud that is called a coma. But when astronomers tried to find evidence of a coma around 'Oumuamua, their searches turned up empty. They theorize it is because 'Oumuamua is smaller, making the gas hard to detect, or that it lost most of its smaller-sized dust grains during its voyage. What remains are bigger dust grains, that are harder to push off the surface. But the difficulty in making the observations, she explained, is 'Oumuamua is the first known interstellar visitor. There are no other objects like 'Oumuamua that scientists can compare it to — at least until we find another interstellar visitor. The 'Oumuamua findings were published in the journal Nature. Marco Micheli of the European Space Agency lead the study. 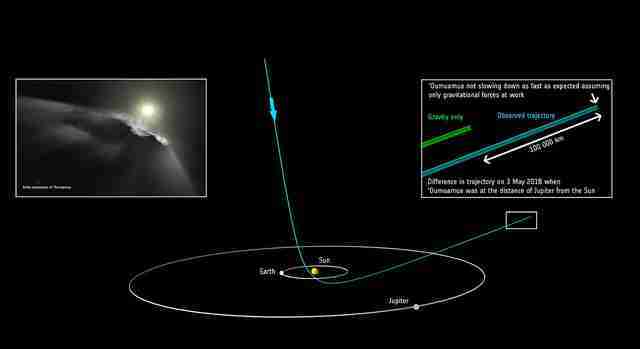 There are some things that we can say about 'Oumuamua compared to other comets, Meech said. At only 800 meters long (roughly half a mile), 'Oumuamua is quite small compared to a typical 2 kilometer (1.2 mile) or larger comet. 'Oumuamua is also cigar-shaped. That elongation is extreme, at a length to width ratio of about 10 to 1. In our own solar system, Meech explained, there are only a few objects that are more elongated than 5 to 1. Another way in which ‘Oumuamua is comparable to a comet, Meech explained, is it reflects red light more efficiently than blue, just like organic-rich comets. Organic molecules are the building blocks of life, and include elements such as carbon. She cautioned, however, that other minerals can preferentially reflect red light. But given 'Oumuamua's comet-like behavior, scientists have a strong argument that its surface contains organics. ‘Oumuamua is quite far away now from our telescopes, making it difficult to do much more analysis. So astronomers continue to scan the skies in the hope of finding another interstellar visitor. Meech said astronomers are interested in learning more about the chemistry of ‘Oumuamua and similar objects, to learn what ingredients of life and planet-building are present in different solar systems. She praised the Panoramic Survey Telescope and Rapid Response System Telescope in Hawaii for finally being able to spot interstellar objects such as ‘Oumuamua, which were hard to see beforehand because they move very fast. "You need to be able to scan all of the sky frequently, and you need to be able to look for very faint objects. We have only had big surveys good at doing this very recently," Meech said. Newer observatories will make the search for interstellar objects easier. The new Pan-STARRS2 telescope came online a few months ago with an even more powerful digital camera to take better pictures of the sky. Meech also said the Large Synoptic Survey Telescope, with its 8-meter (26-foot) mirror, will be another excellent candidate for interstellar object searches when it sees first light in 2022.